Click HERE to read my article about the Indian railways! Click HERE to check out a fantastic musical video performance on YouTube about The Hippie Trail. This video reflects a lot of my feelings ablout the trip. Several young backpackers in the late sixties and the early seventies travelled the long way by land from Europe to Kathmandu through Turkey, Iran, Afghanistan, Pakistan and India to Nepal. The majority spent a few months or half an year out there, and a few of them settled in Nepal or India for years, living on a low budget with hash and other drugs. It became a trend, unmistakable connected to the hippie generation, founding the backpacker's massive conquer of the world several years later. But why did they do it? There are several answers to that question. The romance of the road, the attraction of drugs, the need of breaking the daily, monotonous way of living, the search for direct experience, the desire to explore what's on the other side of the desert or the mountains, the curiosity to foreign, exotic cultures. And to quite a few, a search for their own identity. However, no matter which reasons took them on the trail, they have one thing in common: Few of them remained the same persons after their return, and it's no exaggeration to say, that the trip became decisive for their behaviour and points of view for the rest of their life. Several Danish backpackers from that period, who came home after a long stay in India or Nepal, were unable to do very much during the next half year after their arrival - apart from gazing at a wall, trying to digest their great experience! 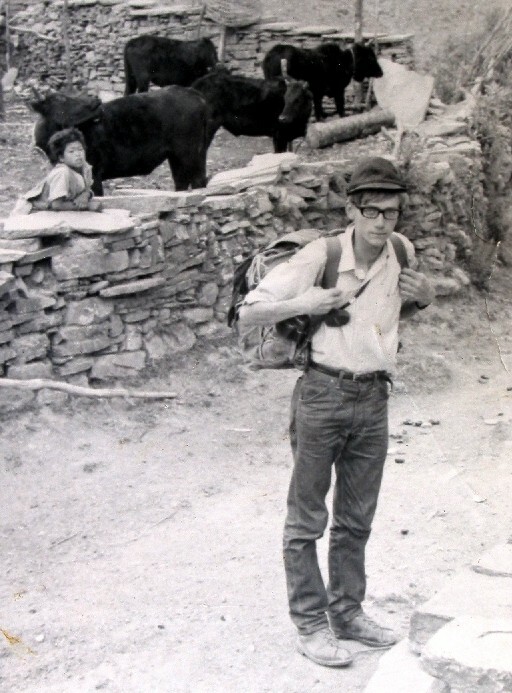 Frontiers of many kinds were crossed by the hippies and the backpackers of the past. In the late sixties and early seventies, travelling to the third world was much more complicated and unusual than today, and for the same reason, places like Kathmandu and most of the sites along The Hippie Trail were much more exotic than now. In the sixties and early seventies, individual travels to The Middle East and The Far East was an exotic experience, which had the capability to change you forever. Backpackers from the sixties and seventies didn't have today's security at all. E-mail, credit cards and mobile phones didn't exist, and a phone call to your home country was a rare emergency action. On the other hand, travellers still had the feeling of being true pioneers and explorers. Those who had never been outside Europe or the other western countries - which was by far the major part - got the cultural shock of their life. 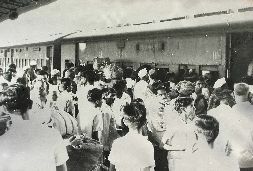 The first really exotic country on the route was Turkey, but the biggest challenge of them all was the confrontation with India. India still has a vast diversity of religions, culture, languages and nature to offer, but to many - especially if you are not used to travelling as an individual - the country can be a real challenge for you! The best things to bring with you are a relaxed mind, patience and a good sense of humour. However, if you don't like curiosity, crowds of people, bureaucracy and a certain amount of insanity, you shouldn't go there, not even today! I travelled along The Hippie Trail by public transport from Copenhagen Central Station to Kathmandu in Nepal during the winter and spring in 1969. My expectations about the trip were at the same time enormous and unreal. I had never been outside Europe before, and like other backpackers, my confrontation with the Orient and the Far East became the travel experience of my life so far. I had several reasons for making the trip, but one of the most important was an old dream of trekking in the Himalayas - a region visited by very few westerners at that time. The trip started at Copenhagen Central Station on an icy, late night, by entering "The Baltic Express", heading for the former East Berlin. Train travels were much more adventurous in the sixties than today, and railways were felt, smelled and heard much more than in today's synthetic, metallic tubes. One of the things I found very exotic was, that "The Baltic Express" used to have a direct carriage from Copenhagen to Moscow in The Sovjet Union. Early the next morning, I reached East Berlin and continued by train to Prague, Budapest, Belgrad and Sofia to Istanbul in Turkey. After some days there, I crossed Bosporus by ferry - the official border between Europe and Asia - and entered another train eastwards through the Turkish wilderness. This train ride was fabulous and adventurous. The train departed from Istanbul in the evening, heading for the town of Erzurum in the east, and the next morning, we were in the Anatolian highlands. It took the train about 2 days to reach Erzurum, passing a beautiful, but very desolate landscape of plains and mountains. Unlike what most people think about the climate of Turkey, the eastern part is extremely cold during the winter due to the high altitude. Erzurum itself is about 2.000 meters above sea level. Erzurum was a terrible place in the winter of the Anatolian highlands - bitterly cold and VERY far from the dreams of the legendary countries waiting ahead! I spent an overnight day there, waiting for a delayed, local bus further eastwards due to snow storms, drinking gallons of tea to keep warm, watching the horse-driven sledges on the streets in February. Finally, we crossed the Turkish wilderness again, passing the legendary Ararat mountain (known as the place where Noah's Ark stranded!). After entering Iran, the temperature raised together with the decreasing altitude, and a couple of days later, I reached the capital Tehran via Tabriz. Entered the night train from Tehran running along the northern branch of The Hippie Trail between Tehran and the very religious town of Mashad in eastern Iran through a marvellous desert area with snow-covered, high mountains in the horizon. In Mashad, I got a visa to the neighbouring country Afghanistan, crossing the border near Herat, and continued by the southern road along the edge of the wild mountains of central Afghanistan to Kabul via Kandahar. The 4 photos to the left show parts of The Hippie Trail from Turkey, Afghanistan, India and Nepal. Unlike the conception of many people, Afghanistan is a land of natural beauty and friendliness, and if there had been no wars for decades, the country would definitely have been included in the programs of several travel agencies. When people of today hear the name Kandahar, almost everybody will think of Osama Bin Laden and Al Qaeda, with ruins and machine guns on the street corners, but I remember Kandahar as a very exotic place with all the features of adventure. We were sitting in a restaurant in the warm night eating Shish Kebab, with she smell of exotic spices and the sound of bicycle bells everywhere in a town with only few cars. From the bus, we saw plenty of camels and bedouins walking along the road. 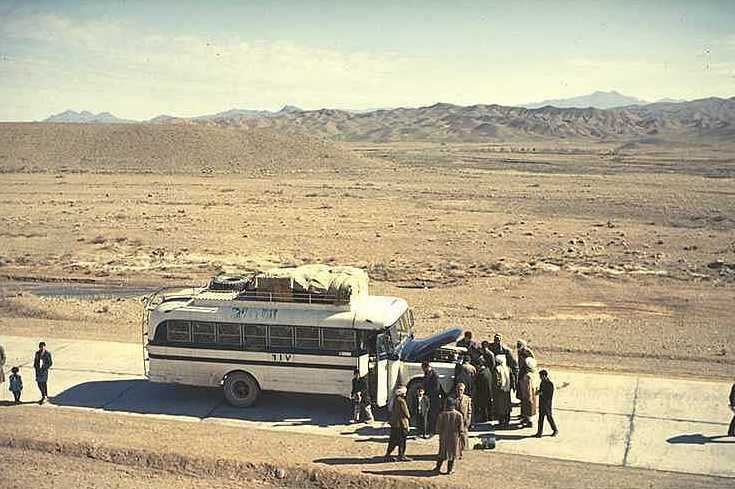 Shortly before the arrival to Kandahar, the bus stopped in the village of Geresk. Everywhere, turban-dressed afghans were sitting in front of their houses in the afternoon sun, playing chess and drinking tea. From Kabul, I descended from the mountains to the heat of the lowlands of Pakistan and India. I entered a local bus at 8 a.m. in Kabul, and after a short time, the road was surrounded by steep mountains, with plenty of tunnels and hairpin bends. After the Pakistan border, the bus climbed the legendary Khyber Pass and continued downwards through another large number of hairpin bends, with rising temperature as we approached the flat lowlands. During the afternoon, the flat river plains of Pakistan and India became visible between the mountains. From now on, the way further eastwards would be a travel for hundreds of kilometers with trains and buses through a flat, hot and fertile landscape. After almost one month of travelling by land from Denmark, I reached India, the first dreamland of the hippies. From Lahore in Pakistan, we went by bus to the Indian border. The border checkpoints were placed along a quiet road surrounded by shady trees and exotic bird song. After a couple of hours, we had passed all the checkpoints, and we were now standing in the legendary India. In order to get on, we hired a horse car to the nearest village Ferozepore. Next, morning at sunrise, I was standing on Connaught Place, in the center of Delhi, the capital of India! Travelling with the Indian railways was an overwhelming experience. The crowds, the total chaos at the stations, the tea vendors, the curiosity, the smell, the dust, the extremely long trains - not to speak of the gigantic steam locomotives, the dream of any railway enthusiasts! In Denmark, the era of steam engines was gone, but not in India! I can't explain why these machines impressed me so much, but several months after my return to Denmark, the whistle of the gigantic, Indian steam locomotives and the heavy noise from the trains crossing the iron bridges of northern India kept playing in my mind. Because of the enormous density of the population, it seemed as if a big part of the inhabitants of India were making eternal train travels. Travelling with an Indian train for days was a hard experience, and no backpackers, who have travelled on a 3.rd class train in India, will ever forget their experience! But believe it or not: Today, several years later, when I look at my photos and read my diary, the train rides in India seem exciting and adventurous! 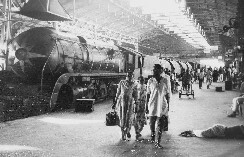 Besides, an Indian railway station was a perfect place to meet the local people, and train enthusiasts will still have a marvellous time there! India has a tremendous number of railways, and these are one of the institutions of the country, which are working very well. The 4 photos to the left are all from india. Now, Nepal was not far away! In Delhi, I entered "The Upper India Express" further eastwards. Admired the flat and fertile landscape of northern India from the lattice windows of the train, listening to the frequent whistle of the gigantic steam locomotive. Crossed several iron bridges from the English colonial period with a deafening noise. Left the train in Agra for a while in order to visit the legendary Taj Mahal - but even here in this fantastic palace, with its smell of incense you could still hear the everlasting whistle from the gigantic steam locomotives. That sound will keep playing in my mind for the rest of my life! Some places find their way into your heart instantly and Kathmandu was one of them. Perhaps the long ride up from the Indian plains helped, but as we topped the edge of the valley and dropped down towards Kathmandu, it seemed like Shangri-La, with multi-tiered temple roofs punctuating the city skyline, oil lamps twinkling through latticed wooden windows and the setting sun warming the snow-capped Himalayan range as a backdrop. Source: Tony Wheeler, the founder of the "Lonely Planet" books. Another 24-hour train travel, and I reached the Indian town of Patna. Still on the flat river plains of northern India, but now the time had come to move north, towards The Himalayas! During the evening and night, I crossed the Ganges river by ferry and took a local train via Muzaffarpur to Raxaul, close to the Nepalese border. So far, no signs of mountains at all - until next morning, when my local bus departed for Kathmandu. After a couple of hours through the flat Terai region with forest, we reached the Himalayan foothills and started to climb. Few bus trips have ever impressed me more than this one! - Just the thought of being in Nepal for the first time was fabulous! I had been dreaming of seeing the Himalayas for several years, and now I was sitting in an old, local bus, struggling upwards among the terrace fields with a furious motor in a low gear. The fresh air and pleasant temperature was wonderful after the scorching heat of India. This 130 km long road was opened in 1953, and even in 1969, it was the only existing road between India and Kathmandu. I arrived to Kathmandu at dusk time in a pleasant temperature, surrounded by temples, exotic smells and friendly people everywhere. So far, my Hippie Trail adventure was finished, and I could now realise my dream and main purpose of the trip: Trekking in the Himalayas! This project was fulfilled beyond all expectations, and my first experience in the mountains of Nepal became some of the most fantastic I ever had. But that's a different story. I hired a sherpa for a dollar a day, who found the right trails, talked with the locals, bought and prepared the food in the villages, etc. Nepal is the country with the world's highest mountain chain with several peaks over 8.000 meters above sea level. It's the country where the daily life of the tribes in many of the villages is still quite close to that of the middle ages. It's the country where walking is not done for pleasure but for basic transport because most of Nepal is still without roads and vehicles. 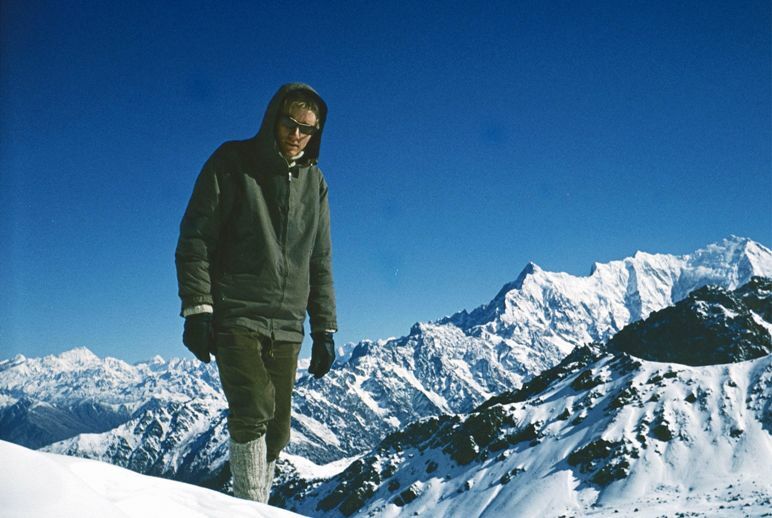 I have been on several treks, but the reward of a climb has rarely been greater than on this early, cloudless morning in spring 1969. From a ridge at the Gosainkund Lakes north of the Kathmandu Valley, at an altitude of about 4.800 meters, I had an overview of hundreds of peaks - from Annapurna in the west, about 150 kilometers away, to the Langtang massive in the east. To my right on the photo is the Langtang massive (7.250 meters). The numerous peaks to my left are in Tibet. And the nature and the isolation is what makes Nepal a Mekka for trekkers. Few westerners, who have made a real trek in the mountains of Nepal, return to their home country without being deeply influenced by the strong impressions you get out there. The hippies were among the first foreigners to discover the magic attractions of Nepal in the sixties when they were virtually the only tourists in the country. Since then, the number of visitors has grown to enormous quantities. In 1952 there were 562 tourists, in 1964 the number had grown to about 10.000, in 1968 there were more than 20.000, and today, the tourism has almost exploded. Kathmandu HAS become a modern town with all the good and bad consequences of that, but the Kathmandu valley itself and the old part of the town are absolutely worth visiting. And the mountains of Nepal with its hundreds of villages and numerous tribes and languages will still keep their peace and tranquility for many many years. The trip to Nepal along "The Hippie Trail" in spring 1969 changed my life and became decisive for many of my personal attitudes later. I was one of the lucky guys, who visited The Middle East, The Far East and the Himalayan mountains before the massive tourist invasion at the end of the previous century. 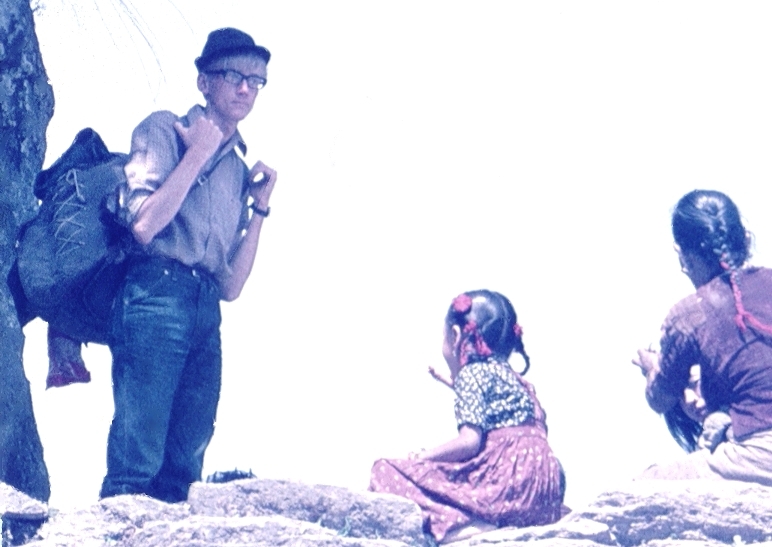 My photos above are from spring 1969 on my trek along "The Jomoson Trail" starting from Pokhara. Today, the route is blessed with a road, but in the sixties, you had to walk all the way to Jomosom along a marvellous and adventurous footpath. Several months after my return, I lost interest in most of the ordinary, daily events, and to me, the only interesting subjects were Nepal, India and the Himalayas. Small pieces from my experience turned up all the time and kept playing in my mind like film strips: The ringing bells from the yak caravans on the trails of the Himalayas, the religious music from the mountains of Nepal, the smell of incense in the temples and the monasteries, the whistle of the gigantic, Indian steam locomotives, the heavy noise from the trains crossing the iron bridges of northern India, and several others. To me, the trip started a life of continuous travelling. Once you have discovered the potential of individual travelling, it's very hard to get rid of the desire to keep on exploring new parts of the world.